PR-619 | CAS:2645-32-1 | SuperLan Chemical Co.,Ltd. 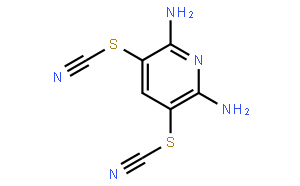 PR-619 is a cell-permeable pyridinamine class broad-spectrum DUB inhibitor whose known targets include ATXN3, BAP1, JOSD2, OTUD5, UCH-L1, UCH-L3, UCH-L5/UCH37, USP1, 2, 4, 5, 7, 8, 9X, 10, 14, 15, 16, 19, 20, 22, 24, 28, 47, 48, VCIP135, YOD1, as well as deISGylase PLpro, deNEDDylase DEN1, and deSUMOlyase SENP6. PR-619 are shown to increase overall protein polyubiquitination in HEK293T cells in a dose- and time-dependent manner (20 to 150 μM, 0.5 to 20 h). PR619 treatment results in upregulation of both K 48 - and K63-linked polyUb chains. PR-619 induces HCT116 cell death with EC50 values of 6.3 μM.